The dates have changed, but the situation is the same. The Lone Star System has once again waged war against the peaceful Planet Nebula. Her wounds only recently healed, it's taken eighteen years for the planet to reverse the decimation and destruction the last attack left behind. Led once again by Reficul, Emperor of Lone, he's launched a fleet of attack ships to thwart any attempts to stop him. And that includes you. The mother ship Plealos is docked at Nebula's spaceport. She and her crew are commanded by Reficul inside the ship. It's your mission to pilot the super space jet Thunder Force II and guide it strategically to the port deep below the planet's surface. To succeed, you need to survive. And it won't be easy with five levels of intricate places to pass through where ultra combat weapon forces wait to demolish your ship. But first you've got to get there. Flying high above Nebula, the scene below looks very bad. And if staying out of the line of fire seems difficult now, be prepared for the worst later. Because once you're underground, even obstacles pose a threat to your chances for survival. This is stuff that separates the men from the boys. So good luck brave one, and remember, heads up! --From the Genesis Thunder Force 2 instruction manual. 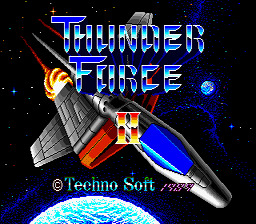 Play Thunder Force 2 Now!